Purpose – The purpose of this paper is to describe a framework for conceptualizing the role of emotional and social skills in effective leadership and management and provides preliminary suggestions for research and for the development of leader emotional and social skills. Design/methodology/approach – The paper generalizes a dyadic communications framework in order to describe the process of emotional and social exchanges between leaders and their followers. 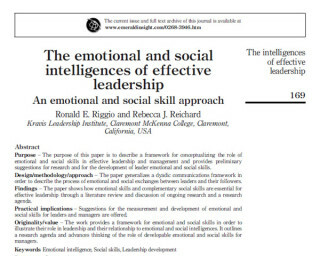 Findings – The paper shows how emotional skills and complementary social skills are essential for effective leadership through a literature review and discussion of ongoing research and a research agenda. Practical implications – Suggestions for the measurement and development of emotional and social skills for leaders and managers are offered. Originality/value – The work provides a framework for emotional and social skills in order to illustrate their role in leadership and their relationship to emotional and social intelligences. It outlines a research agenda and advances thinking of the role of developable emotional and social skills for managers.